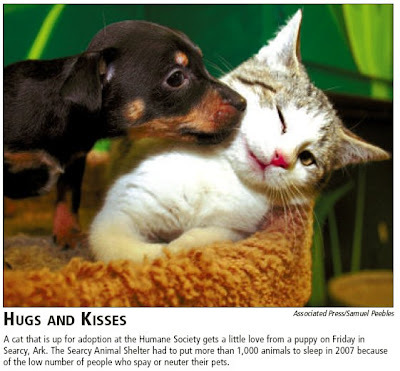 A cat that is up for adoption at the Humane Society gets a little love from a puppy in Searcy, Arkansas. The Searcy Animal Shelter had to put down over 1,000 animals in 2007. Why? Because of the low number of people who spay or neuter their pets. Can you imagine if we did this with humans? Please, SPAY or NEUTER YOUR PETS!! !